This model is available for immediate cryorecovery. Carries a genomic deletion of a region of mouse chromosome 7 that corresponds to human chromosome region 15q13.3. Schizophrenia related phenotype: EEG characterization revealed auditory processing deficits similar to those observed in schizophrenia. They have impaired long-term spatial reference memory and decreased performance in the novel object recognition task. Epilepsy related phenotype: Human 15q13.3 deletion mice show changes in neuronal excitability in acute seizure assays, with increased propensity to develop myoclonic and absence-line seizures; decreased propentisty for clonic and tonic seizures. Orders by weight: Taconic cannot accept orders by weight for this model. Please note that shipments may contain animals with a larger weight variation. The Df(h15q13)/+ mouse line was developed for H. Lundbeck A/S at Taconic Biosciences GmbH (Cologne, Germany). Two targeting vectors were generated using bacterial artificial chromosome clones from the C57BL/6J RPCI-23 library and transfected into TaconicArtemis C57BL/6N Tac embryonic stem cell line. The first vector introduced a loxP site upstream of the Chrna7 gene. The second vector introduced a loxP site downstream of the Fan1 gene. Homologous recombinant clones were isolated and the 1.28 megabase region on mouse chromosome 7 between the loxP sites was removed using in vitro Cre-mediated recombination. Hemizygotic embryonic stem cells were injected into blastocysts isolated from impregnated BALB/c female mice and transferred to pseudopregnant NMRI female mice. Chimeric male pups were selected by coat color and mated with wild-type C57BL/6 female mice. Finally, a chimera with germline transmission was selected for expansion breeding. The colony was maintained by mating wild-type C57BL/6N mice with hemizygous Df(h15q13)/+ mice. Fejgin K, Nielsen J, Birknow MR, Bastlund JF, Nielsen V, Lauridsen JB, Stefansson H, Steinberg S, Sorensen HB, Mortensen TE, Larsen PH, Klewe IV, Rasmussen SV, Stefansson K, Werge TM, Kallunki P, Christensen KV, Didriksen M. (2014) A mouse model that recapitulates cardinal features of the 15q13.3 microdeletion syndrome including schizophrenia- and epilepsy-related alterations. Biol Psychiatry. 2014 Jul 15;76(2):128-37. 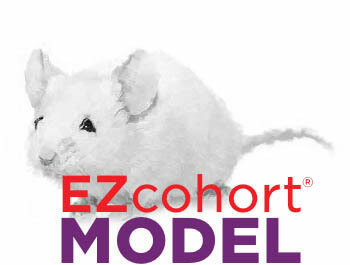 EZcohort® models are invoiced upon shipment. Once orders are placed, full purchase price will be applied if order is cancelled. For orders greater than 4 mice, please contact customer service. This model is sold under terms which grant perpetual use rights. A mouse model that recapitulates cardinal features of the 15q13.3 microdeletion syndrome including schizophrenia- and epilepsy-related alterations. An acetylcholine alpha7 positive allosteric modulator rescues a schizophrenia-associated brain endophenotype in the 15q13.3 microdeletion, encompassing CHRNA7.